I have an interesting issue that I'm more or less looking to find out if it's possible to fix or not. If you click the highlighted part, the workbook in SharePoint closes and goes back to the document library that the workbook is saved to. If you close the pop up by clicking the X, it stays open, which is what we want. My question is this: Is there a way to not have this pop up appear and to just leave the workbook open in the browser? I tried looking for an answer to this already but it's incredibly hard to find relevant materials because all of the results are just about fixing issues with the sheets opening. Everything is working fine for us we just want to know if we have the option to disable this pop up from appearing. Note: I do not want to change the behavior for opening Excel files. 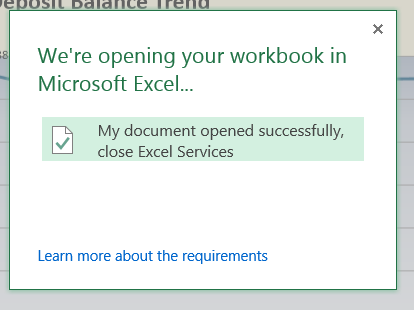 I want them to open in the browser and have the option to open in excel, just without having this pop up that closes the browser version. It's also interesting to note that we are getting the behavior we want when it's on a 2010 site (and 2010 excel services with Office 2013) but in SP2013 with Office 2013 we get that pop up. I'm assuming it's a change in how Excel services works across the two versions. I think you will not face the same pop-up dialog when you open the SharePoint site from within the internet explorer, though the problem is a web browser oriented one. Also the behavior changes when using Mozilla Firefox. Not the answer you're looking for? Browse other questions tagged 2013 sharepoint-server excel excel-services browser-compatibility or ask your own question. Unable to use filter or edit Excel Worksheet while opening from Excel web access?